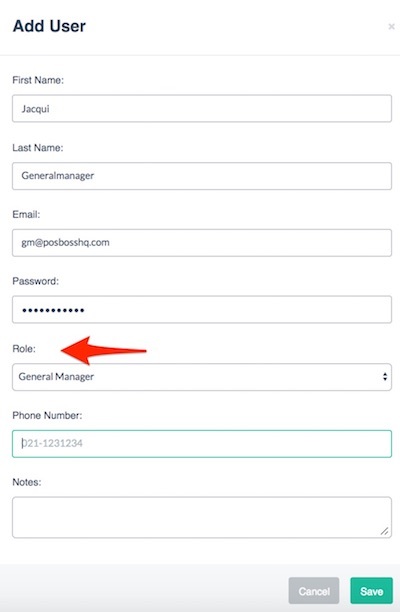 How to set up new accounts for access to the posBoss Management site. A posBoss account is initially created with one master (Boss) login for the management site. The Boss login has access to the support channel. Should you need to give access to anyone else in your business, or the likes of an accountant... you can! And you can restrict their access too. Not what you're after? Looking for staff logins to track actions in the posBoss iPad till app? head here! On the Management site, head to Settings > posBoss Settings > Logins. Here's where you view and create users. Click the New User button to get started and fill out all the fields required. The Email and Password you enter will be the person's login credentials for the Management site. Roles restrict the access a person's login has to the management site. A Staff member will only have access to change the menu, while a General Manager will have access to almost everything. To see what access each role has, click - What do the roles mean at the top of the page. Easy! Get the person to head to the sign in page , press the Forgot your password? link and follow the instructions.